Next week, Reason League of Legends will face off against second place, LowLandLions.White. The Dutch Dynasty has shown that they are not the underdogs in recent matches, taking out mousesports and Dignitas EU 2-0, and only losing to Gamers2 in a 0-2 match. 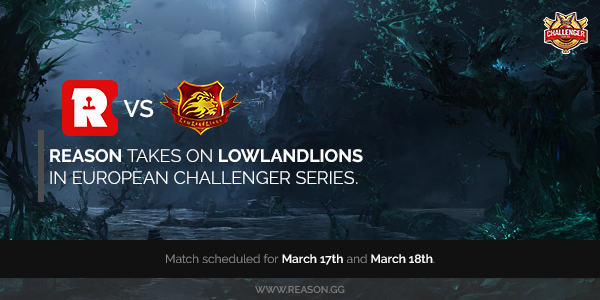 LowLandLions is a team that stormed through their EU CS qualifiers, without dropping a single map, and easily becoming a feared line up. So with that being said, lets run down the lane match ups. Morsu’s top lane is something I personally can’t describe. He’s not your typical “sit back and farm” top laner. He’s aggressive, hyper-carry top laner, that will out shove even the scariest of top laners. His Jax and Irelia are played to the most aggressive play style you could imagine. Reason will need to ban out one of his aggressive champions, and not lane swap in order to have Kubon soak up XP in lane, and hopefully counter his aggressive play style. It’s an even match up, but at two completely different play styles. Kirei is a new player, with not much experience, and LLL being his first competitive team. Though he does show his aggressive playstyle very well in game, he also shows his inexperience. He is young, and definitely has the room to improve, but at the same time, he’s not someone to mess with. His synergy with the rest of the team, especially on his high-roaming junglers, is far superior from any Challenger series jungler. Personally, I think he’s more of a team player than Amazing or even our own Xayoo. Much like I said in the beginning, they are not the underdogs. CozQ is also another unknown, newer player, joining his first professional organization with LowLandLions. Although he’s new, his assassin plays in midlane are absolutely incredibly. In my personal opinion, he’s the Dutch Faker. He’s able to outplay some of the top junglers when they gank, and escape with just a sliver of health. This young man’s playstyle is very similar to that of Cloud 9’s HaiL9 with a dab of Team SoloMid’s Bjergsen. Definitely some of the best assassin play to come out of Europe. The lane combo of Vizility and Hybrid is that of a puppy and his chew toy. This is a very inexperienced lane duo, with only Vizility having prior experience, with AT-Gaming. Many thought Vizility was retired after his departure from AT-Gaming, but he definitely alive and playing. This lane seems to have trouble with their counter picks, lane swaps, and finding the kill. They play incredibly passively until the jungler comes, and even then, they hang out in the back, waiting for someone to come to them. The rest of LowLandLions seem to treat them like the punching bags in-game, letting them casually farm, die on occasion so they’re not worth any gold, and then come back in the mid-late game. They don’t even give Vizility red buff in certain matches. This is definitely going to be a completely different match up for Celaver and Libik, but I am positive their synergy will triumph. LowLandLions are a new, and fairly inexperienced team, that manages to use their uncommon playstyles to win them matches. They let Kirei get fed, while the others play more of a support role. I don’t think anyone knows how to play against this, and G2 probably got lucky in their 2-0 as LLL is a fairly easy team to read and that’s where G2 succeed in. Reason needs to ban Ahri if they want to win the mid-lane, and ultimately, the games. Vision control will also play a huge part, and counter-jungling will completely shut down Kirei. If Reason read their opponent properly, they’ll pull the same 2-0 that G2 did on Week 2.